the Northern Worker: The Iron 5 Win the SMI Strike! The Iron 5 Win the SMI Strike! After a hard fought 127 day strike the Iron 5 have prevailed against Specialty Minerals Inc. The workers and the company announced a tentative agreement this week that included all of the workers demands. We offer our heartfelt congratulations to these five brave men who have been out there every day since Jan. 1, from 5:30am to 6:30pm, walking the picket line. They endured a lot of brutal weather, the absence of a paycheck and the uncertainty that inevitably comes from taking on a deep pocketed corporation like SMI. But despite the odds, they stood their ground, refused to accept the concessionary contract SMI was demanding, and they won! And in doing so they have inspired workers across the region! 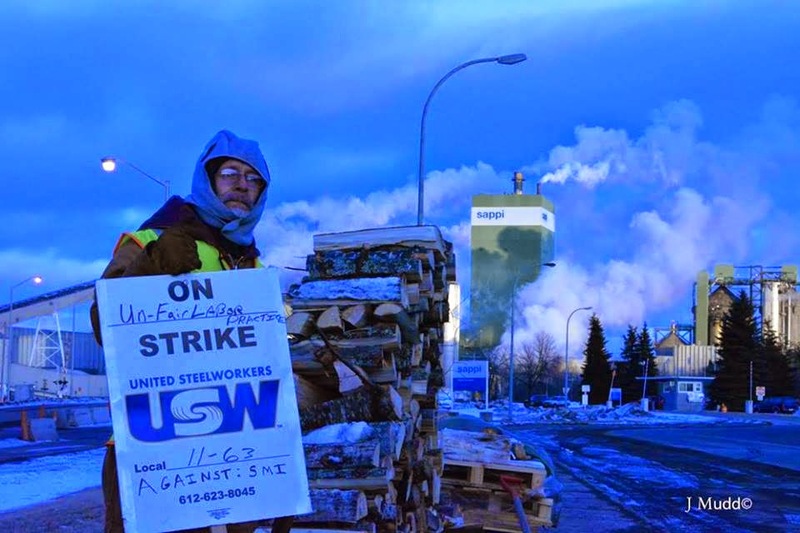 The five SMI workers are members of United Steelworkers Local 11-63, the same union local that represents the workers at the Sappi paper mill that the SMI plant shares a campus with. SMI makes a clay slurry that is used in the making of high end paper products at the Sappi mill. They went out on strike following nine months of bargaining, three contract extensions and a steady barrage of deep concessionary demands by SMI. Finally enough was enough, and the five workers voted unanimously to reject the company’s final offer and went out on an unfair labor practice strike at 12:01 AM on January 1, 2015. The union had filed unfair labor practice charges against SMI for failing to bargain in good faith with the union by failing to provide requested, relevant information necessary for collective bargaining. Key issues in contention were health insurance, pension funding and the definition of “work-week,” along with a company demand for no hourly pay increase in the first year of the agreement. During the strike SMI tried to keep their plant going by importing scabs from its other plants all over the country. Not being familiar with the specific processes used by the SMI plant in Cloquet, the scabs caused a number of screw ups that resulted in a lot of low quality and spoiled product. And at times that scabs attempted to file complaints against the strikers with the police, and at one point attempted to push their vehicles through the picket line. For their part, the strikers defended their picket line, no matter what the weather or what provocation the scabs threw at them. 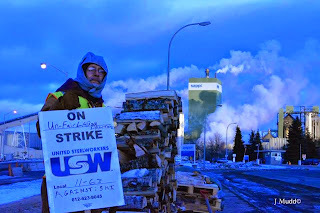 Throughout the strike a number of supporters showed up to walk the line from the Sappi plant, other Steelworker locals, Socialist Action, the IWW and misc. unions in the region. 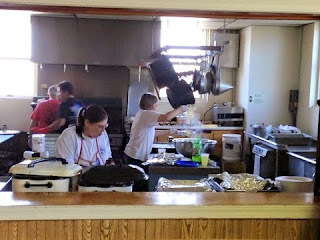 Supporters also succeeded in raising tens of thousands of dollars in donations that helped the strikers keep gas in their vehicles, and the lights and heat on at their homes during the long strike. A highlight of fundraising was the spaghetti feed at the Cloquet Labor Temple on Apr. 27 that drew hundreds of people and raised $3,500. Other demonstrations of support included a solidarity car caravan from the Twin Ports, BBQs on the picket line, and a number of on site rallies. All in all this was a very inspiring strike, and one that no doubt will set a positive example for workers throughout the region for how to fight and win! We salute the Iron 5! Well done brothers! > The article above was written by Adam Ritscher of United Steelworkers Local 9460.